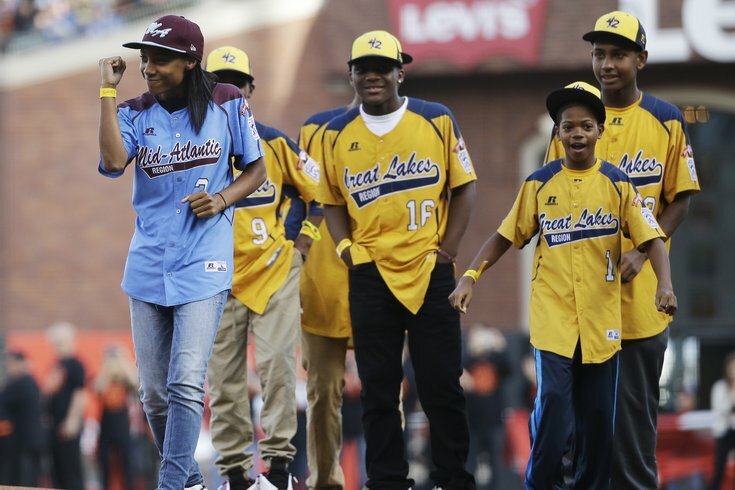 Mo’ne Davis accompanied by players from the Jackie Robison West Little League team before Game 4 of the World Series. CHICAGO — Citing "new information," Little League International officials met Tuesday to discuss whether last summer's Little League World Series national championship team from Chicago's South Side added top suburban players in violation of residency rules. In the U.S. semifinal game, Jackie Robinson West eliminated phenom Mo'ne Davis and the Taney Dragons Little League team from Philadelphia, 6-5, before beating the West team from Mountain Ridge Little League (Las Vegas), 7-5, to advance to the title game, where it ultimately lost to South Korea. Mountain Ridge coach Ashton Cave said Jackie Robinson West should be stripped of its title if the team broke the rules. Stripping a Little League champ of it's title is not unprecedented, specifically when it comes to the use of ineligible players. In 1992, a team from the Philippines had to forfeit its title after the coach revealed that just six of his players were from the appropriate district and claimed that the others were added by government officials hoping to beat Taiwan in the international championship. Then, more notably, there was the case of the 2001 team from the Bronx and star pitcher, Danny Almonte. It was later uncovered that Almonte was actually 14 years old while pitching in Williamsport and the team had its championship stripped. In both cases, the title was given to the runner-up. Cave, however, said that rather than award his Las Vegas team the U.S. championship, Little League International could send a more powerful and lasting message by simply leaving the space blank where the championship team is listed. This past summer, the stirring run to the Little League World Series by all-black Jackie Robinson West captured national attention and united Chicago, which remains one of the nation's most segregated cities. The Cubs watched JRW play during a rain delay and cheered them on while Mayor Rahm Emanuel organized all-city watch parties. The Rev. Jesse Jackson said his Rainbow/PUSH Coalition would take the boys to Disney World.